Sikh scores 1st in Masters Class at Metric Prone NRA Regional! Why does SikhNet ignore the accomplishments of Sikh marksman? SikhNet and the Yogi Bhajan cult should be proud of Sikhs who excel at marksmanship but instead SikhNet ignores orthodox Sikhs? Sikh scores 1st in Masters Class at Metric Prone NRA Regional! Help place Sikhs on US Olympic Shooting Team! 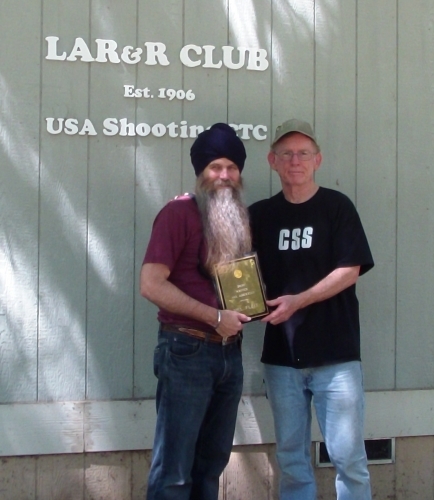 Sikh scores 1st in Masters Class at Metric Prone NRA Regional Match! Help place Sikhs on US Olympic Shooting Team! This two day shooting tournament consisted of eight matches. Waheguru blessed me to place first for the overall aggregate in the master class. In one of the individual matches I also placed 1st in the Master's class. Only Waheguru knew that I would become a Sikh in the 40 years since I made the California State rifle team in 1973! Now again in 2013 Guru Sahib has brought me back again to represent Sikhs and be one of the top marksman in California. The shooting sport is perfect for Sikhs as Guru Gobind Singh Ji told us to train with weapons of all kinds so we can protect not only our families but all those that cannot defend themselves. Guru Gobind Singh Ji- in the epic composition Zafarnama (composed in the Jungles of Maachiwara): "I used weapons of all types Swords, Scimitars, daggers, weapons of all types, we worship these." Guru Gobind Singh Ji (direction given to the Khalsa): When all peaceful means have failed, it is lawful to pick up up the sword. Guru Gobind Singh Ji (in the Jungles of Maachiwara upon hearing that his two sons aged 7 and 9 years had been entombed alive upon their refusal to convert to Islam): I shall make the sparrow hunt the hawk and I shall make one man fight a legion, then only shall I be called guru. Guru Gobind Singh Ji: "I salute the weapons of ALL Names ||. I salute the Arms of ALL Kinds ||". Another goal of the "Sikh Shooting Team USA" is to qualify Sikhs for the US Olympic team. We invite all those interested in learning target shooting skills to join the team. Gursant Singh will be coaching team members using his many years of experience qualifying for US Olympic shooting team tryouts. View videos from the Modesto rifle match I recently competed in can be viewed at these YouTube links. These videos will give you more understanding about the smallbore rifle shooting sport.